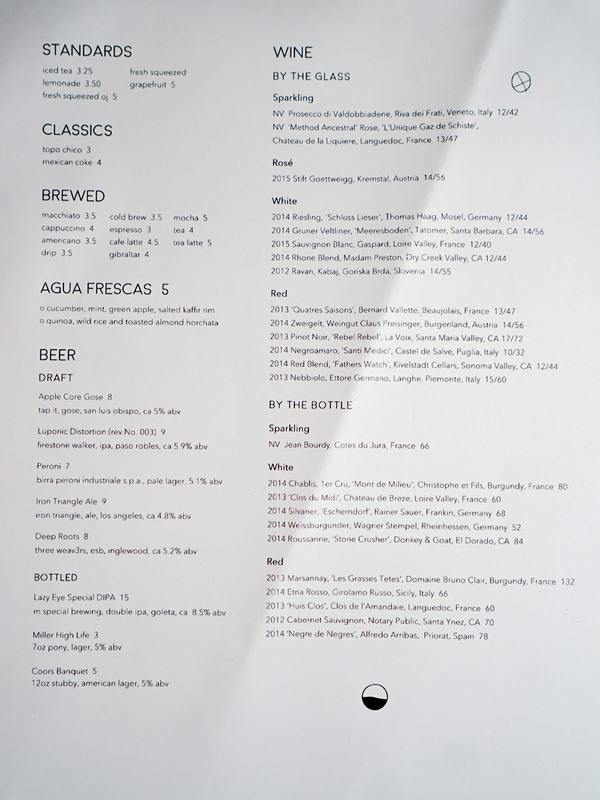 The last time I reported on Jeremy Strubel, he had just checked out of Sirena after working a stint at Rustic Canyon. 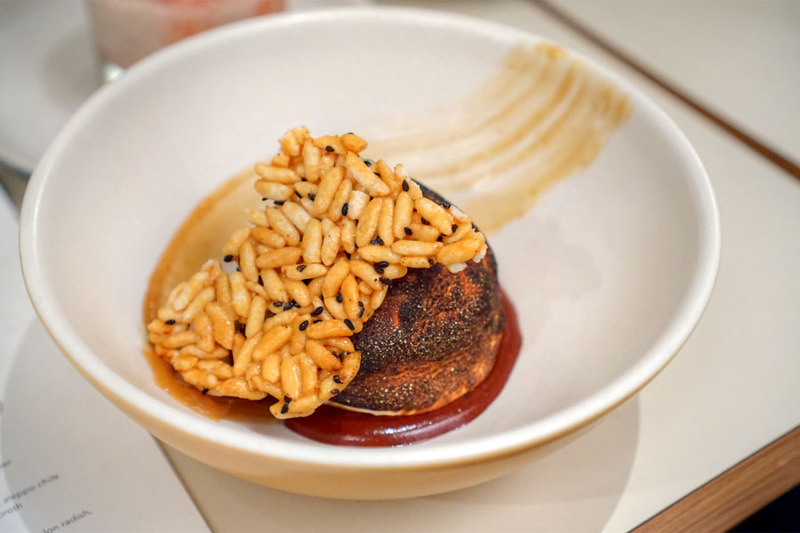 He popped up again on my radar late last year, when it was announced that he'd be Chef/Partner at Winsome, a new all-day restaurant located on the bottom floor of Echo Park's The Elysian apartment building. 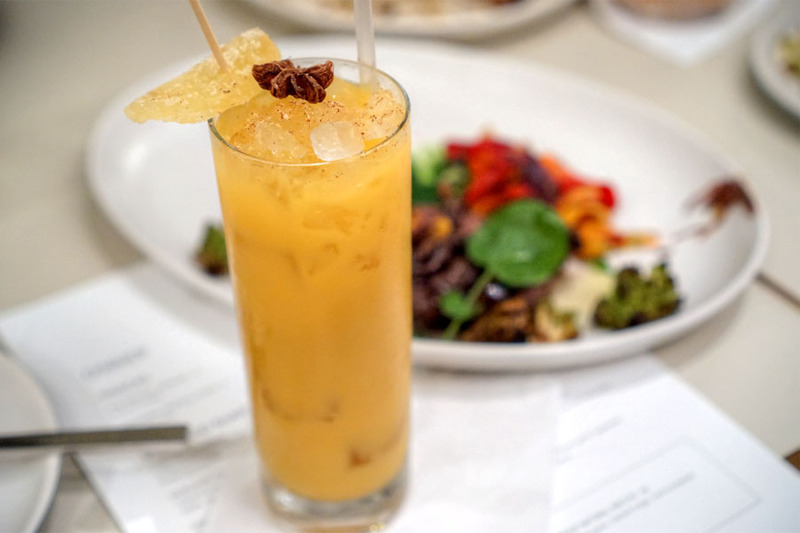 The place comes to us from Marc Rose and Med Abrous, the guys behind The Spare Room at the Hollywood Roosevelt, and opened in February for breakfast and lunch (and brunch) before dropping dinner at the start of August. Joining Strubel in the kitchen is another Jeremy, Jeremy Meyer, an alum of CUT who serves as Executive Sous Chef. 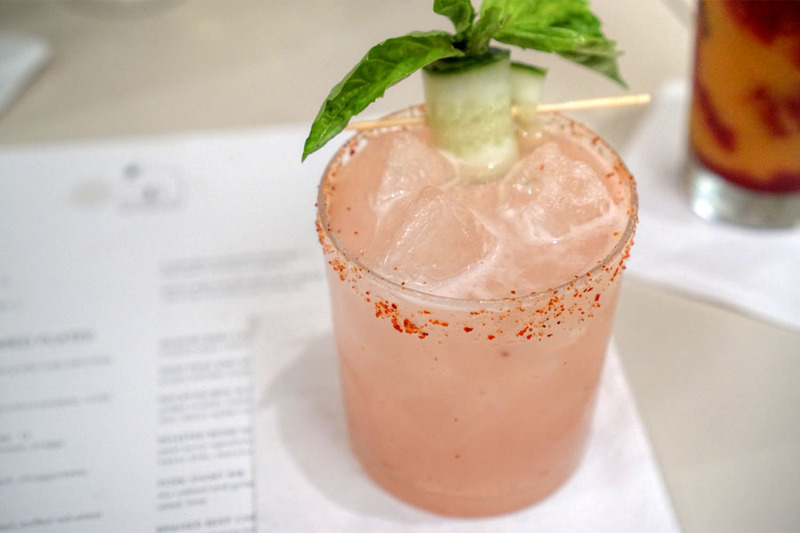 The restaurant is housed in a 1963-era William Pereira-designed structure that was formerly home to the Metropolitan Water District headquarters. The 75-seat space by Wendy Haworth Design has a mod diner sort of vibe, rendered in what appears to be fifty shades of beige. Ample patio seating is provided. 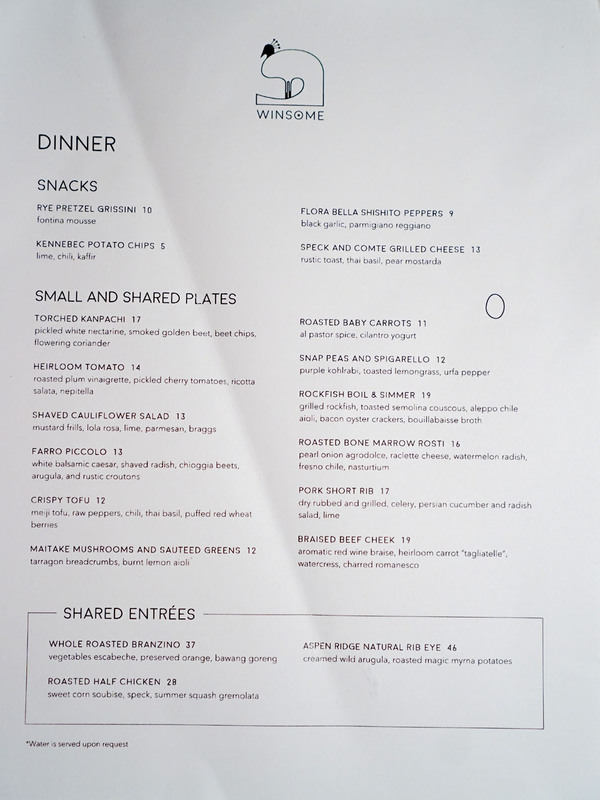 Winsome's dinner comprises mostly small plates, with a few snacks and mains, and of course there are separate breakfast, lunch, and brunch menus as well. 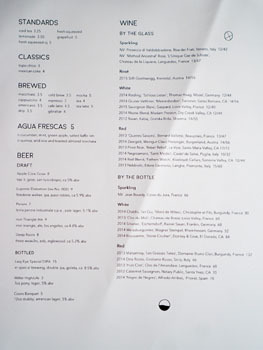 Drinks-wise, you get some pretty interesting sounding cocktails from Beverage Director Edwin Cruz, a small wine list, five beers on tap (and a couple more in bottles), as well as a selection of soft drinks. Click for larger versions. 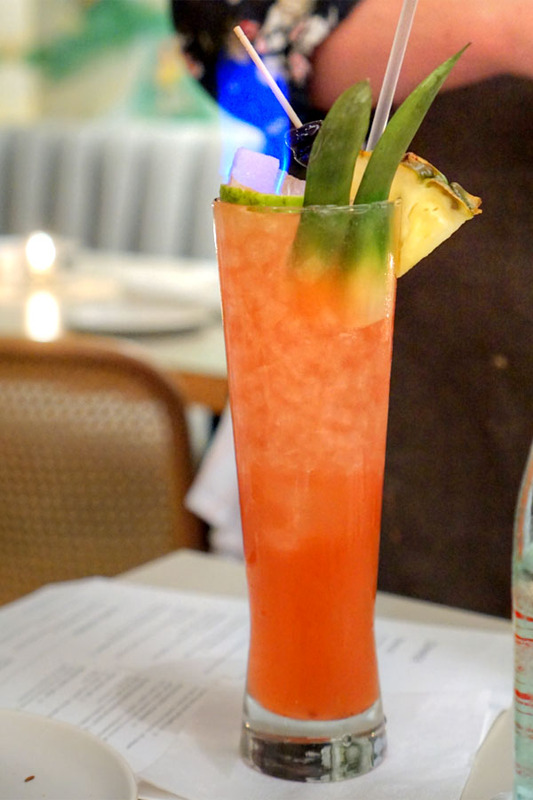 We focused on cocktails this evening and began with this tiki-inspired number, one that showcased a balance of sweetness and smoke accented by pricks of tart citrus. A good start. 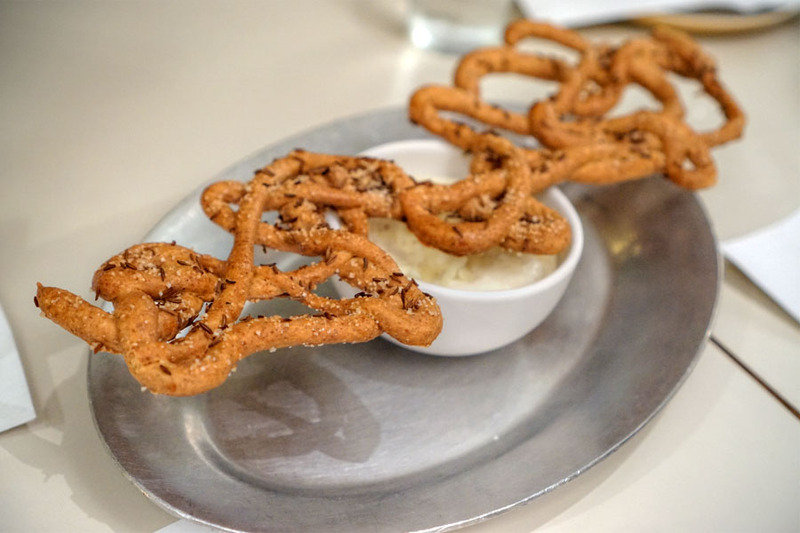 A free-form breadstick was super crunchy, with a very strongly spiced rye component. Make sure to give it a dip in the slightly sweet, almost bracingly cold mousse provided. Texturally, the chips were a mix of crisp and flaccid, and taste-wise, the lime/chili and what seemed like lemongrass were front and center. Great counterpoint from the cool, tangy crème fraîche-based dip on the side. 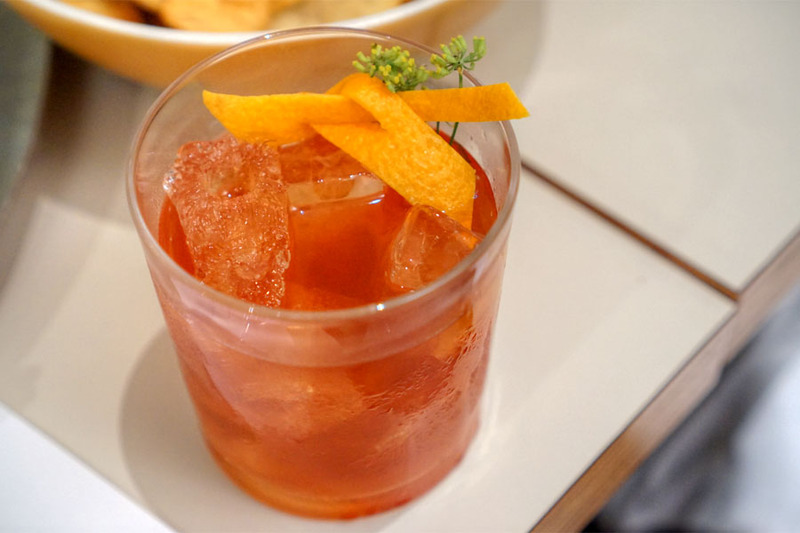 Our next cocktail definitely went boozier, the rye marrying well with bitter and sweet flavors while the orange contributed some uplifting aromatics. Shishitos came out smoky and bitter, with a trace of sweet spice to 'em and a touch of salt from the Parm. Tasty, though the black garlic wasn't really necessary. I would've liked some meltier, gooier cheese here, but the combo of speck and Comte did make sense, and I especially appreciated the unexpected brightness imparted by the Thai basil. 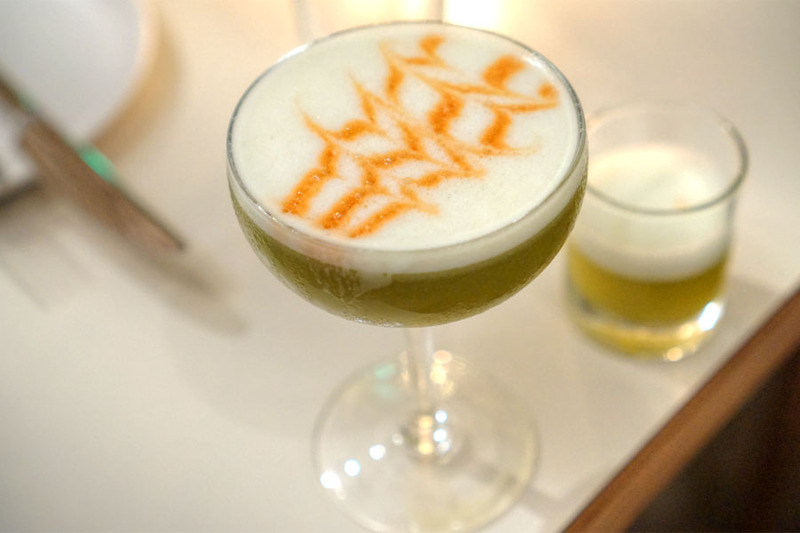 A light, eggy nose on this cocktail led to a sweet, soft palate, one that was lightly astringent and conveyed a bit of a vegetal quality. 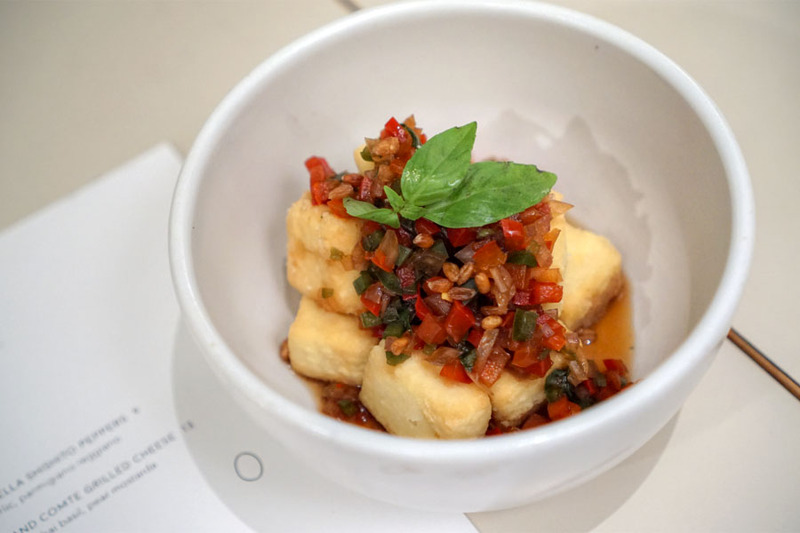 Cubes of tofu were delicate, with a slight crispness. I did appreciate the savory-spicy kick offered by the pepper- and chili-infused topping, though there was too much of it. 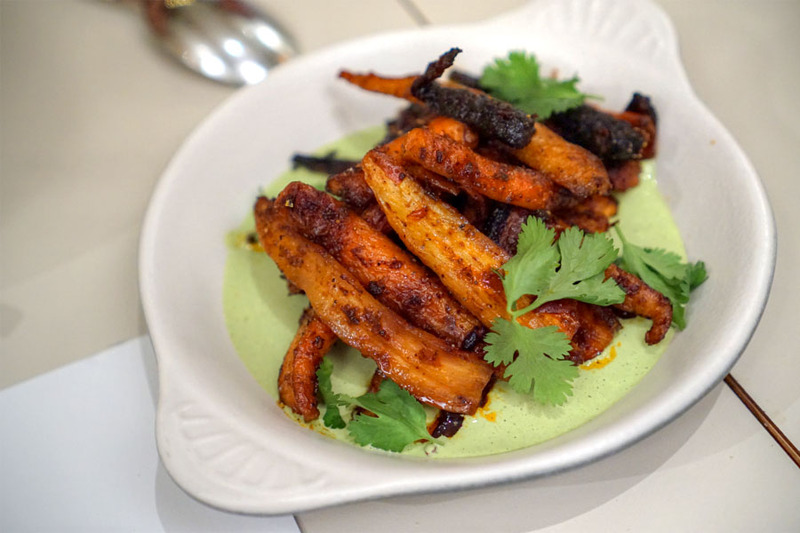 Carrots displayed a balance of sweetness and heat, with the cilantro providing a welcomed herbiness on the finish. Texturally, they were soft to the bite, so I did want some crunchiness here as a counterpoint. 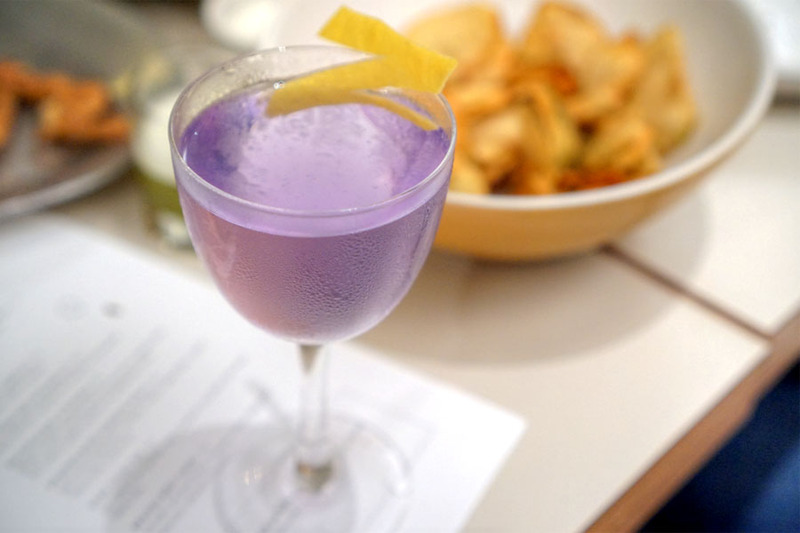 This violet-tinted cocktail had a strong vegetal component on the nose, intertwined with lemon. In terms of taste, the botanical nature of the gin was at the forefront, joined by considerable amounts of celery and herbaceous spice. 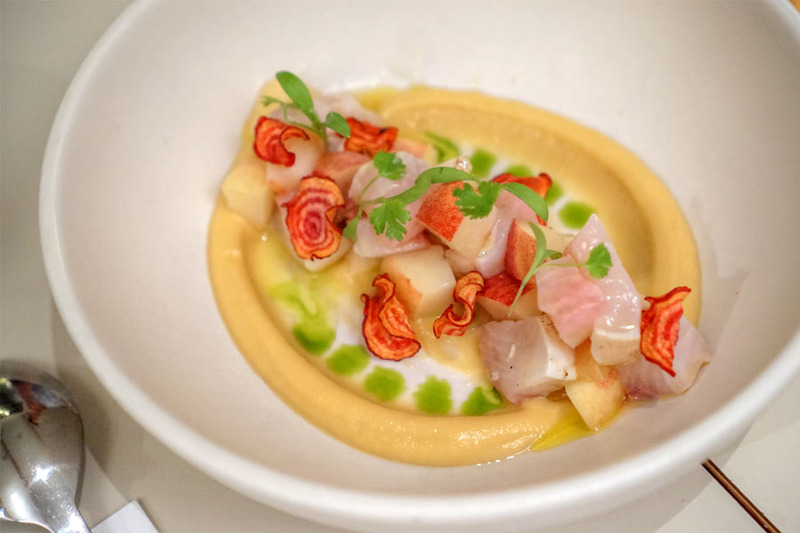 Dense, fatty blocks of amberjack went pretty well with the fruitiness of nectarine, while the smoked beet seemed to emphasize the weightier elements of the fish. Key was the cilantro again with its bright, zippy flavors. Earthy, woodsy maitakes worked hand in hand with the austere, astringent quality of the greens, an effective combo. The crumbs gave a pleasant crunch to the entire dish, thus leaving the texture box checked as well. I found this next drink rather refreshing, and almost lemonade-y in essence actually, though the vegetal, peppery notes present did keep things in check. Pork was falling-off-the-bone tender and came loaded with plenty of savory, aromatic spice, so the veggies on the side certainly worked as a balance. Curiously, this really reminded me of a Chinese dish I used to have growing up called fenzhengrou (steamed pork with rice flour). 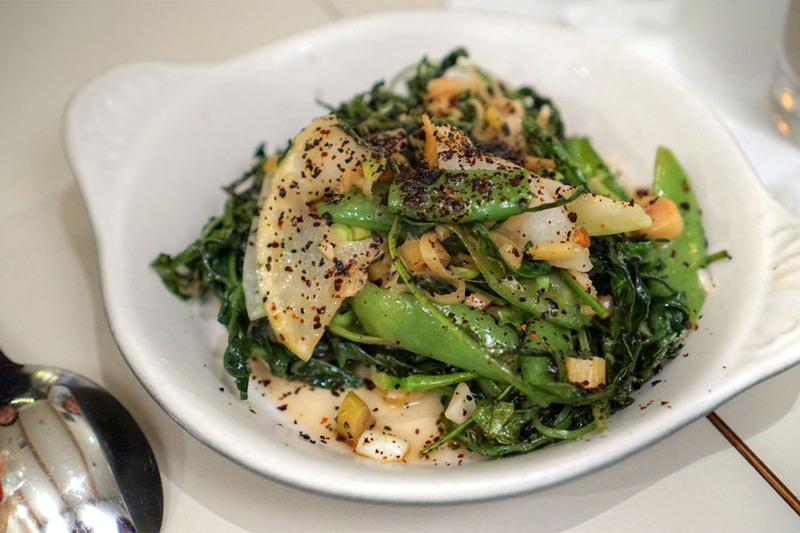 A dish highlighting snap peas and broccoli arrived earthy and bitter, with a rich, deep, almost garlicky savor and plenty of lemongrass in the mix, as well as a sort of South Asian spice overarching everything. 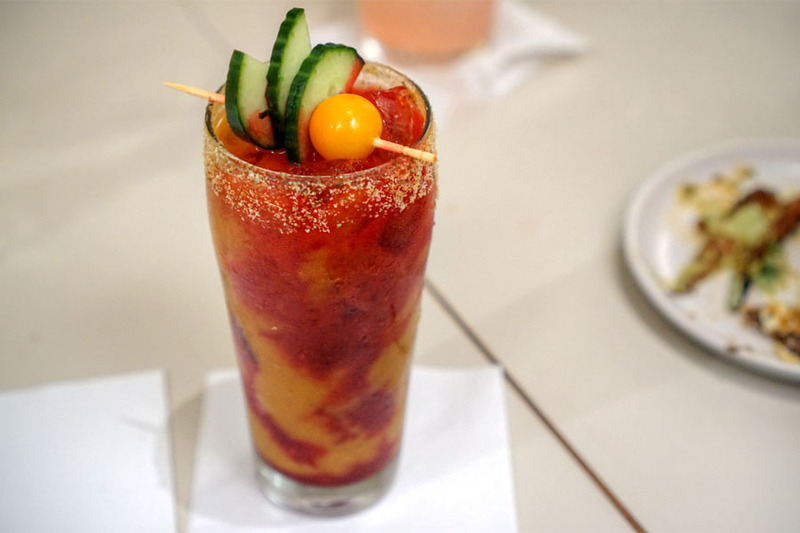 I'm not a big Bloody Mary fan (one of my dining companions ordered it), but the drink was good for what it was. 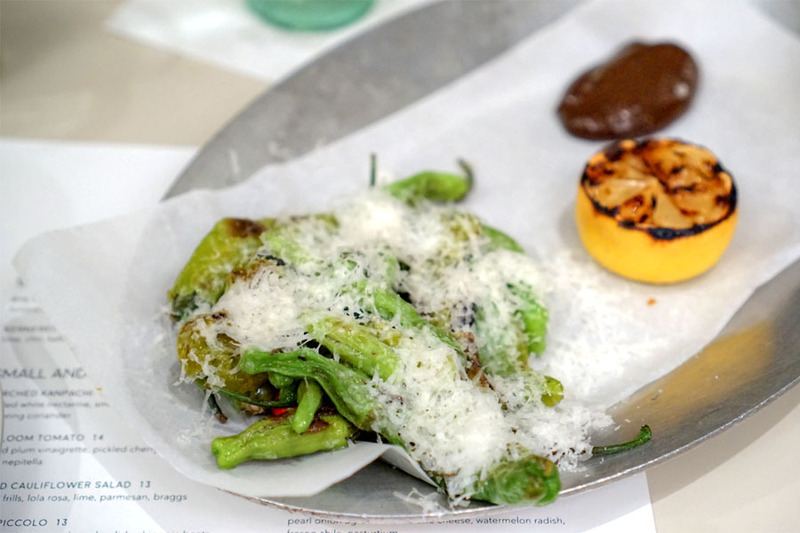 The tomato component was more multifaceted than most, and was paired with a strong, but not overwhelming salty and savory element. 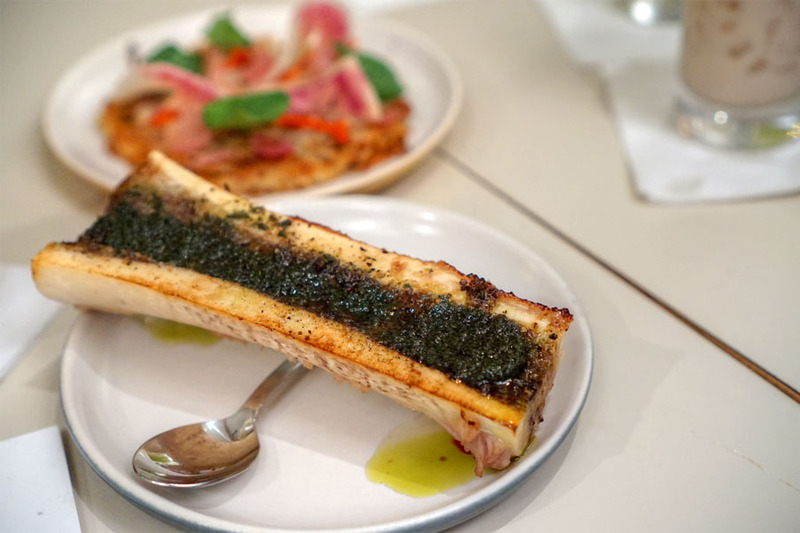 The cheeks arrived nearly gelatinous in consistency, and were teeming with the dark, bovine, red wine-infused flavors that you'd expect. 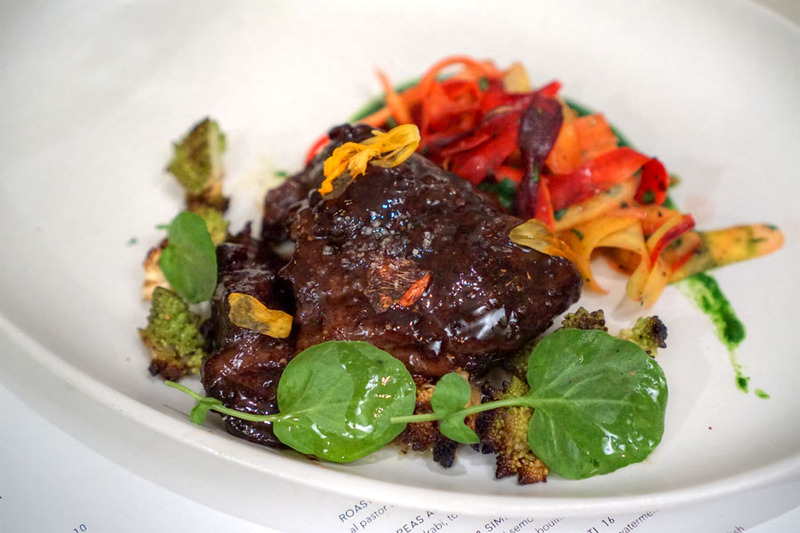 Given the richness of the meat, the carrots and romanesco were key in providing lightness and texture. A favorite of mine. 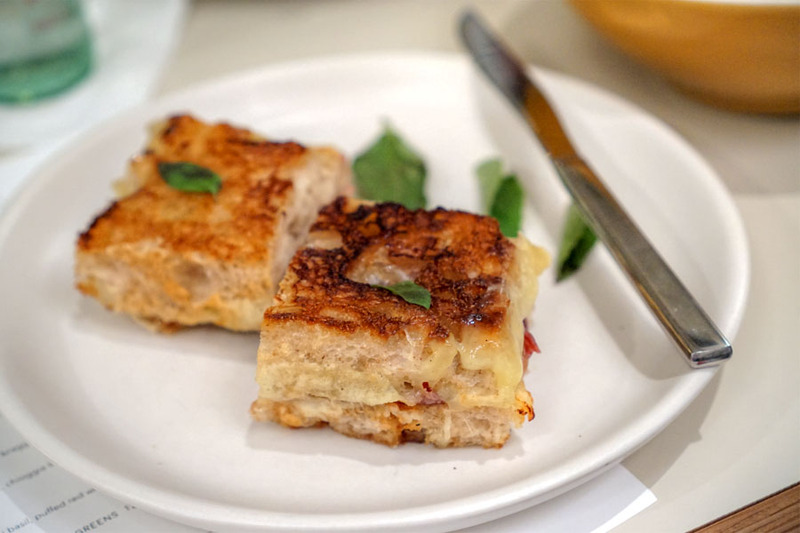 This take on a rösti was akin to a decadent hash brown of sorts, with the well-charred potato patty augmented by slick, fatty splinters of bone marrow. That would've been overwhelming on its own, so the tartness of the agrodolce and the brightness of the greenery were absolutely critical. Our final cocktail was an easy-drinker thanks to its base of rich, fruity flavors, though the aromatics and warm spices present did make for a more balanced drink. Of course, we saved room for the desserts, the work here of Pastry Chef Leslie Mialma (République, LAMILL, Providence, CSCA '04). Click for a larger version. 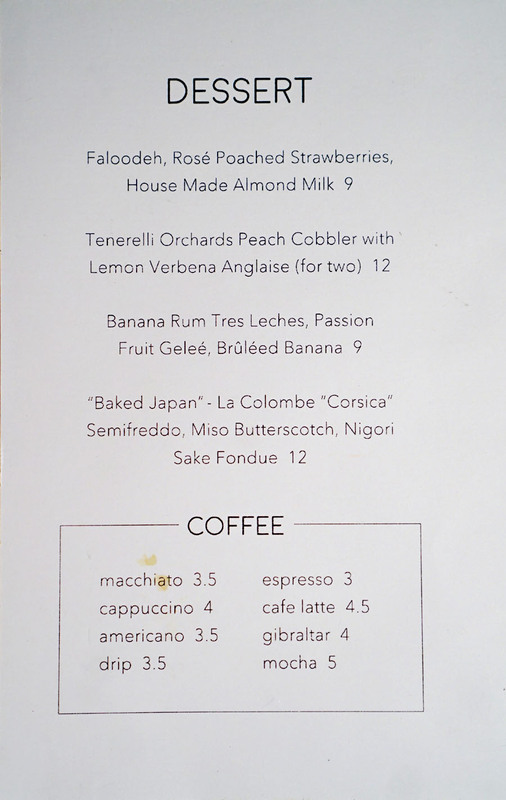 A coffee-rich semifreddo was well-charred, and thus had an astringency and roast that made sense with the potency of that butterscotch, but unfortunately I didn't get much from the nigorizake. Great crunch from the rice cracker though. 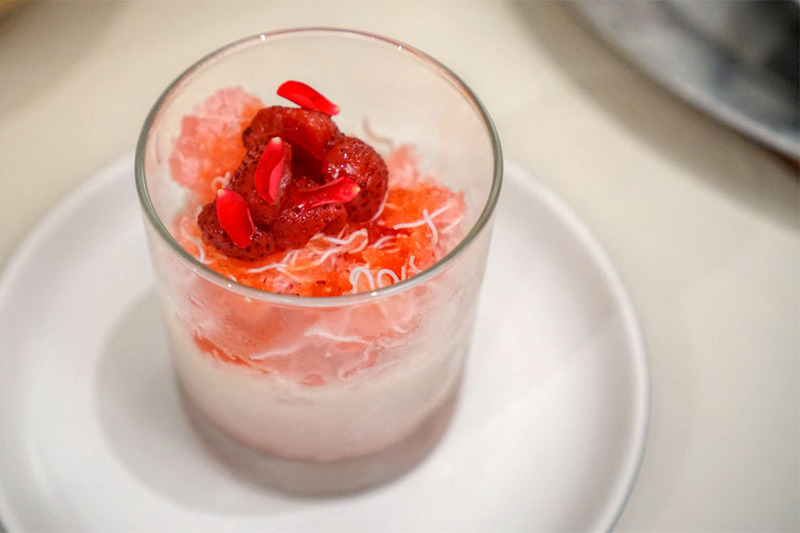 A take on the Persian dessert faloodeh came out extremely cold and extremely floral, with boatloads of rose to go along with the almond milk. Nice texture on the noodles, too. 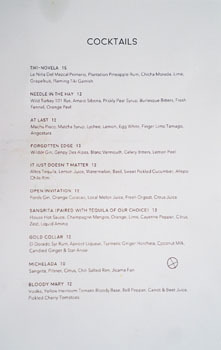 With the cocktails done with, we decided to try the two agua frescas on the menu. 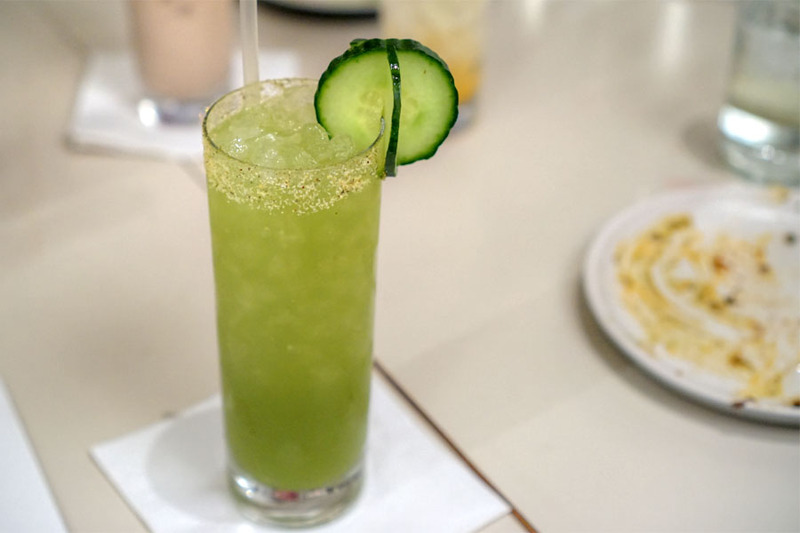 This first one showed off the sweet, tart flavors of green apple, set against cool cucumber and a blast of salt from the rim. 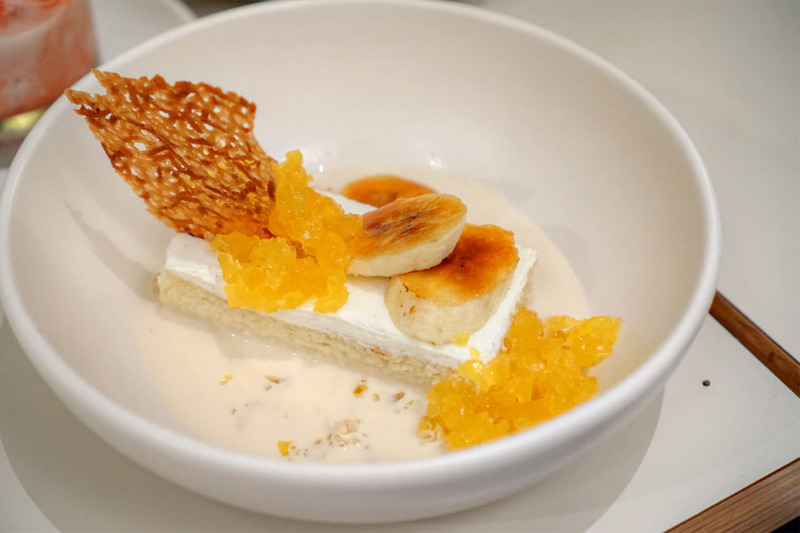 The tres leches was probably my favorite of the desserts, an utterly rich, creamy, saturated cake with plenty of banana and a tropical bent from the passion fruit. 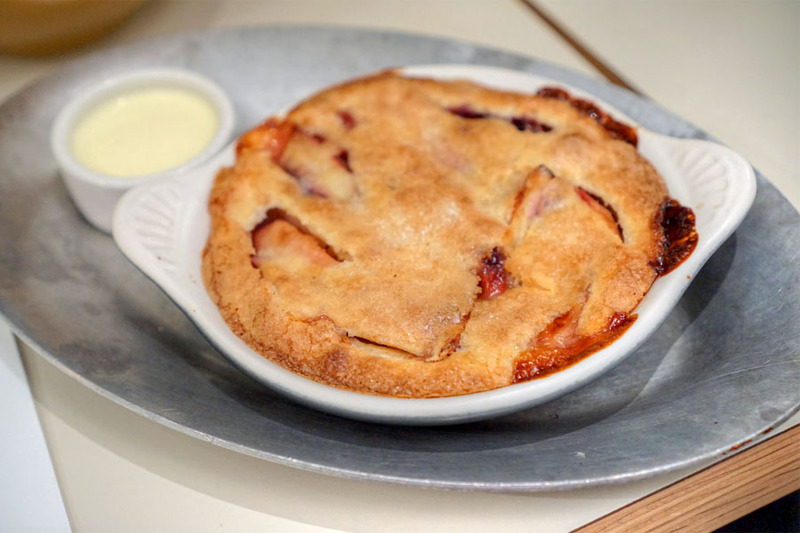 The cobbler was pretty classic, showing up hot, crusty, and decidedly fruit-forward, but also possessed an unexpected zippiness thanks to that crème anglaise. 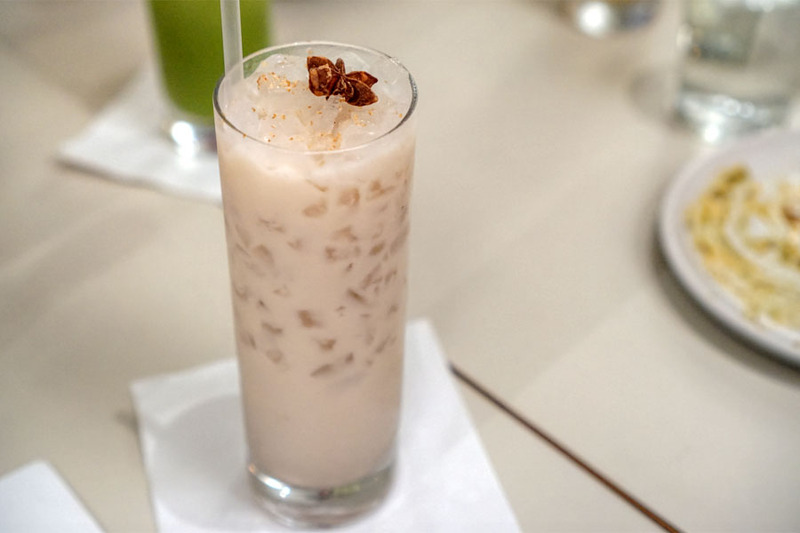 Last up was the restaurant's rendition of horchata, a variation that had your classic sweetness and spice, but also a surprising floral character on the finish that I quite enjoyed. 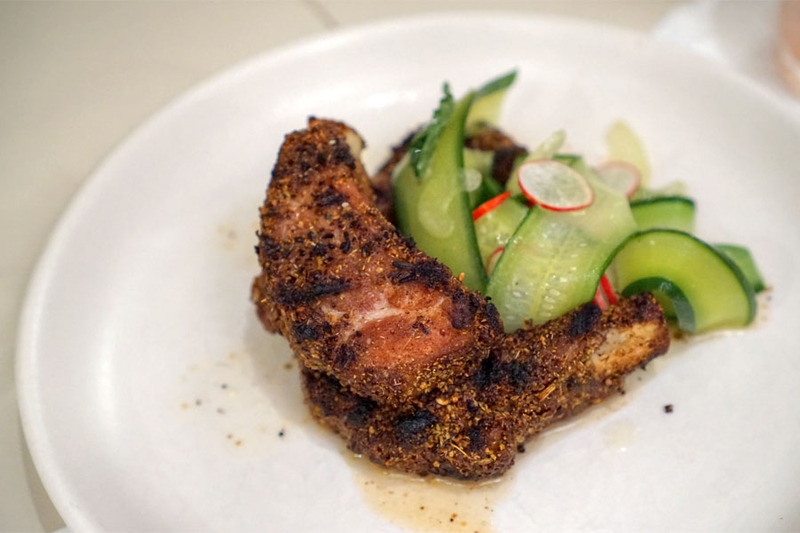 Winsome's a pretty significant addition to the Echo Park dining landscape. 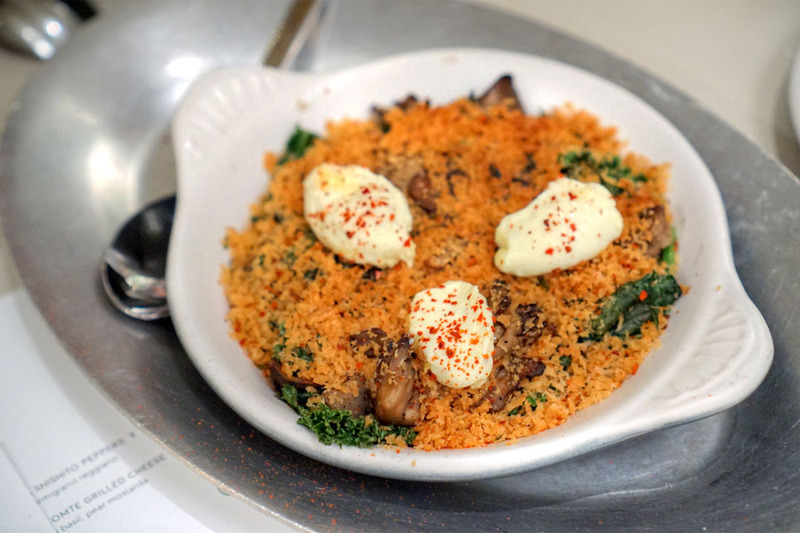 Some of the food could stand a bit of tweaking, but the cooking's largely effective, combining a somewhat modern, multicultural approach with a slightly old school comfort. 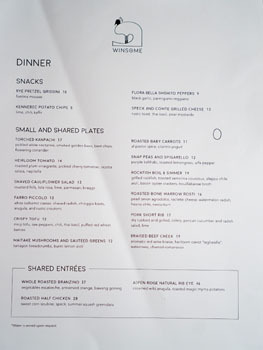 It's some of the most interesting stuff we've seen in the area since the shutter of Allumette, so hopefully this place can stick around a bit longer than Miles Thompson's effort. I'm thinking that the "kaffir" in the potato chips referred to kaffir lime leaves, not kefir. 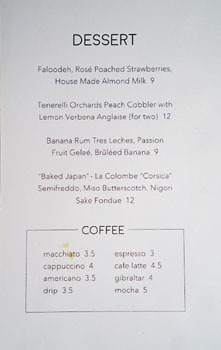 I'm thinking someone mocking the spelling of something on a new restaurant's menu would take two seconds to Google it and maybe question what the green stuff is on his potatoes. I'm aware what kaffir lime is. 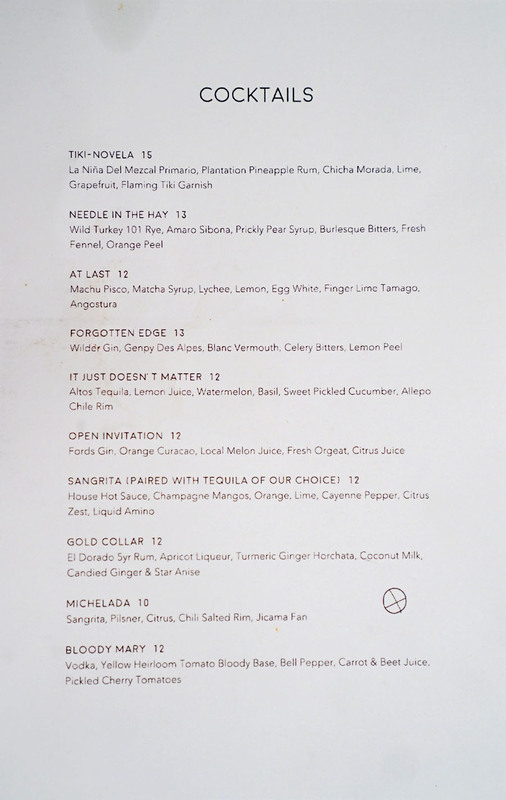 Note that "lime" is already called out in the description, so it seems somewhat odd for the menu to have both lime and kaffir lime listed, but remain silent on the provided dipping sauce. Meanwhile, that tangy, lactic sauce seemed like it could be based on kefir...or maybe not. Well, yes, but if you used kaffir lime *leaves* as a seasoning, you wouldn't refer to them as lime, right? Just a thought. After doing some digging, it appears that we're both a bit in the wrong. 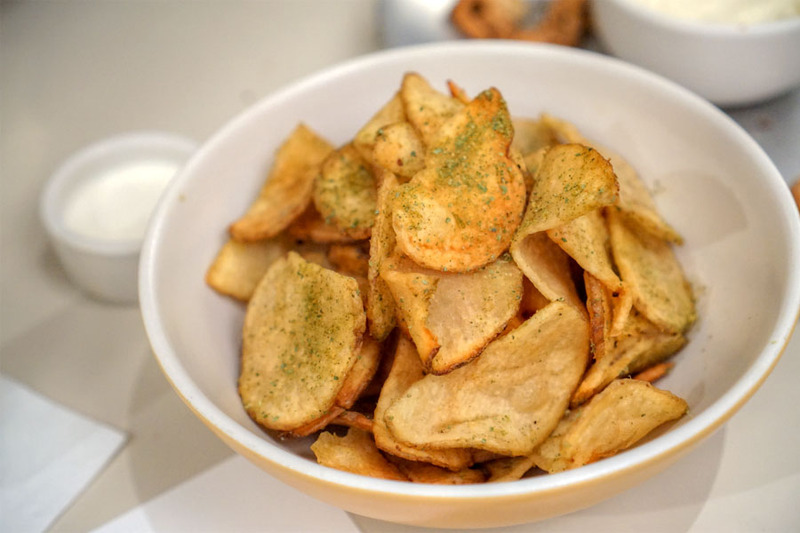 Per the restaurant's Instagram, the correct description should be: "Kennebeck potato chips • chili, kaffir, créme fraîche"
Thus, it's not a kefir condiment, and listing both lime and kaffir lime was indeed redundant. The post has been updated accordingly.